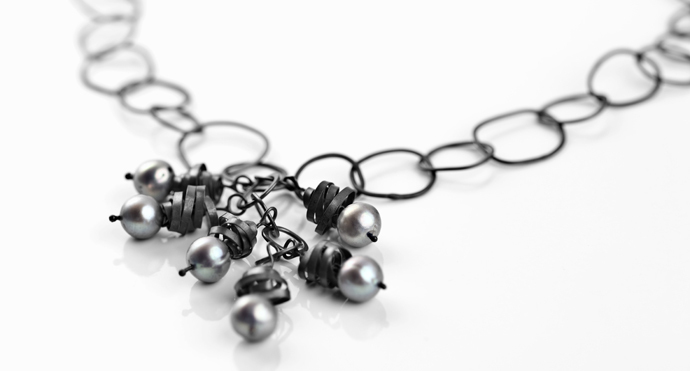 Join our well-equipped workshop and learn at your own pace and choose your own projects or follow a set course. 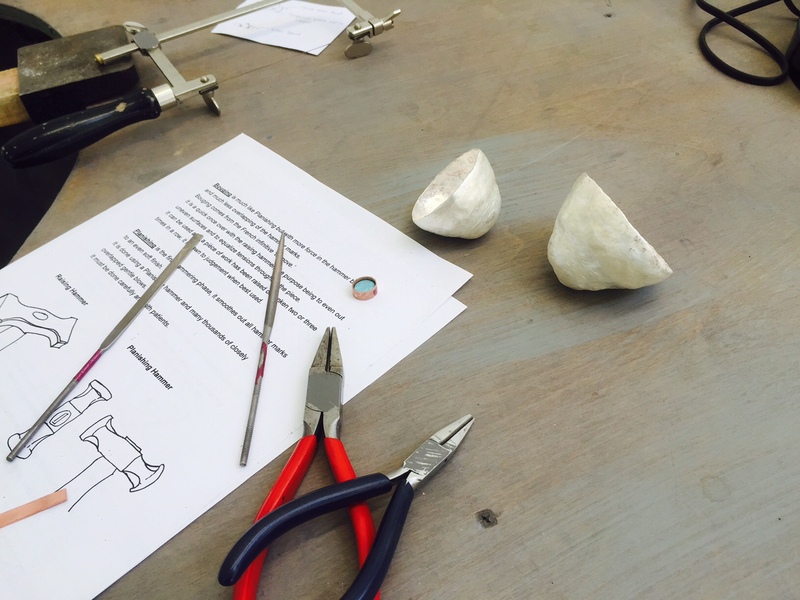 Our friendly classes suit all levels and ages from 18 years upwards. 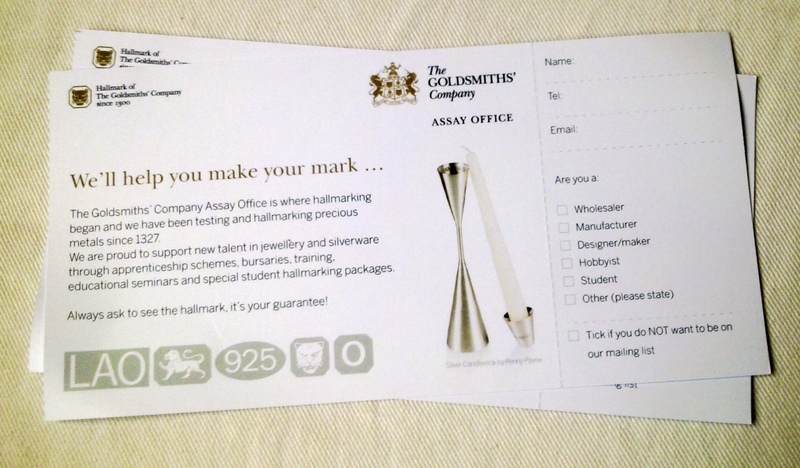 It could be possible to join a currently running course if there are spaces available, do e-mail to find out available. 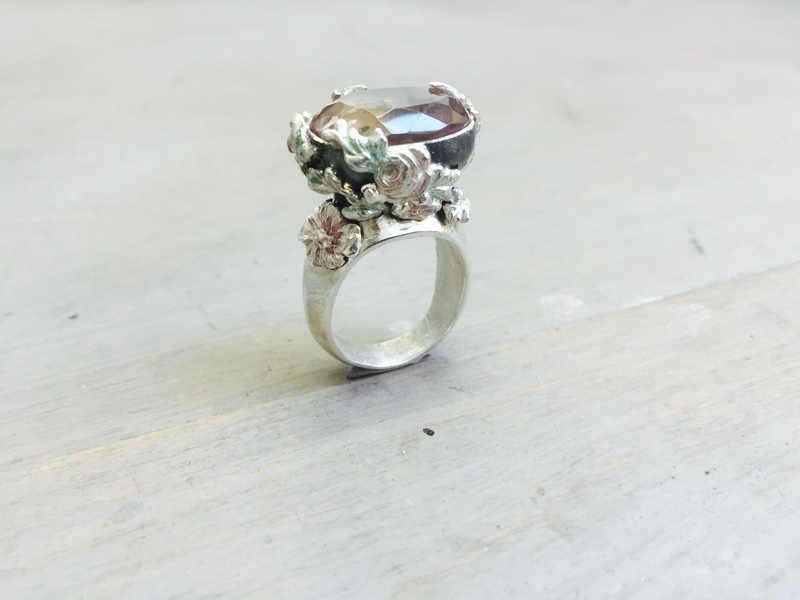 PLEASE NOTE THEY ARE 12 WEEK COURSES BUT I ADD AN EXTRA WEEK ON THE END FOR ANY CLASSES YOU MAY HAVE MISSED, THIS WILL OR WILL NOT BE DONE AT MY DISCRETION. Monday Morning, 29th April – Monday 22nd July, £265; 09:45-12:15. Monday Afternoon, 29th April – Monday 22nd July, £265; 13:15-15:45. Half term starts 27th May. 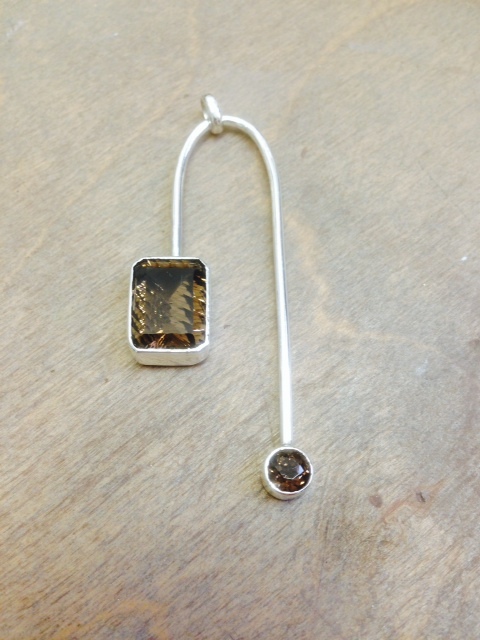 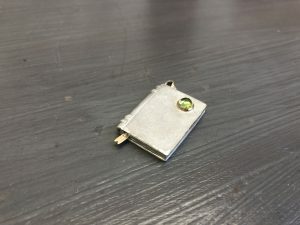 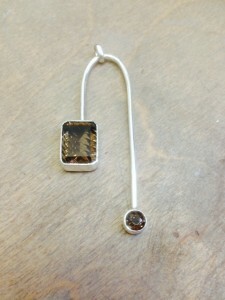 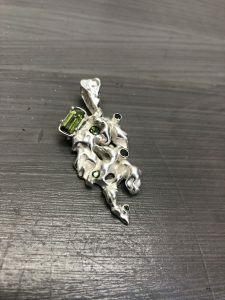 Jane’s silver book pendant with green peridot stone. 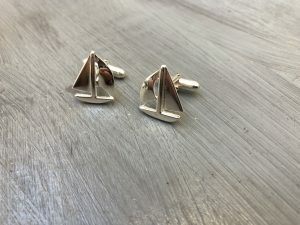 Sailing boat cuff links made by Maria for her husband,. 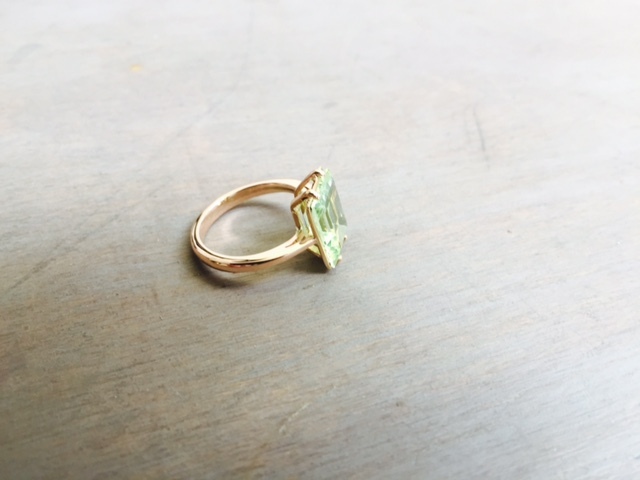 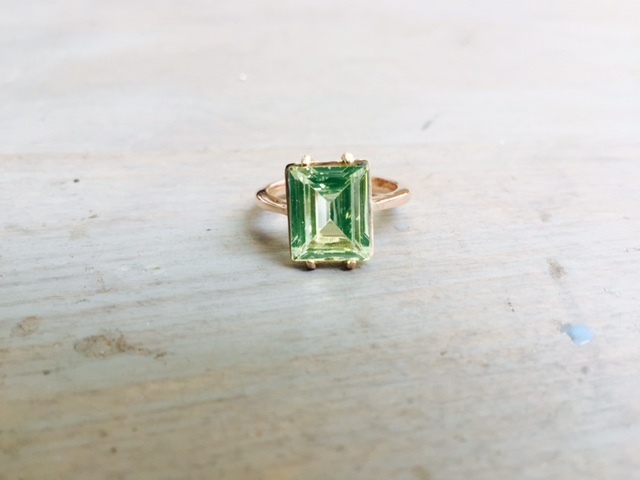 Naomi’s green tourmaline pasta cast pendant. 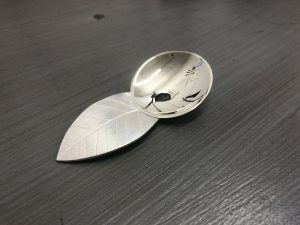 Kim’s tea caddy spoon with leaf texture. 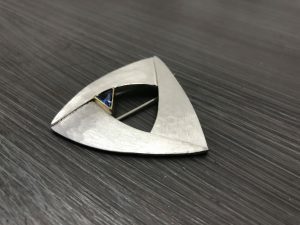 Beryl’s silver brooch with tanzanite stone and double pin. 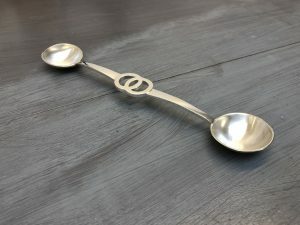 Fiona’s hand forged double ended spoon. 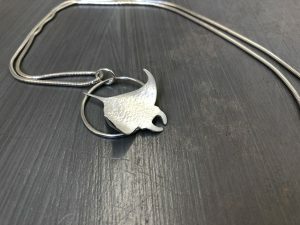 Made a gift for her daughter’s wedding. 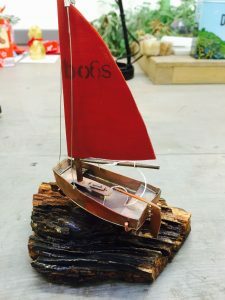 Kim’s copper boat made for her father’s 80 birthday, everything worked on it as well. 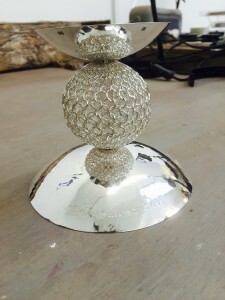 Naomi’s jumpring soldered ball stand with raised silver dishes. 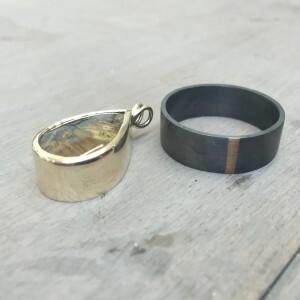 Katy’s beautiful rutilated quartz pendant & Joe’s oxidised silver and gold ring. Sarah’s acid etched copper clock. Guy’s copper plate its finally finished after starting it 2 years ago!! 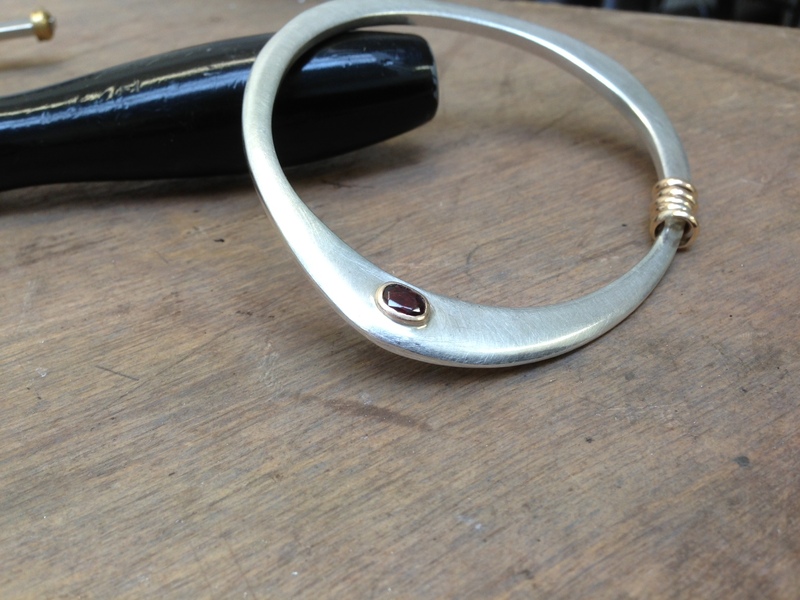 Alison’s hand forged silver bangle with gold setting & ruby and five gold rings. 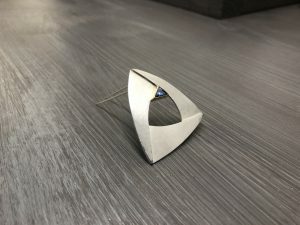 Made on a 12 week course. 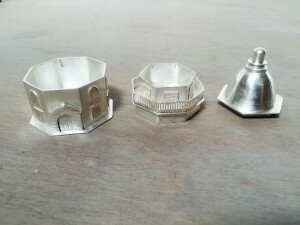 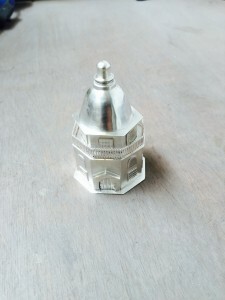 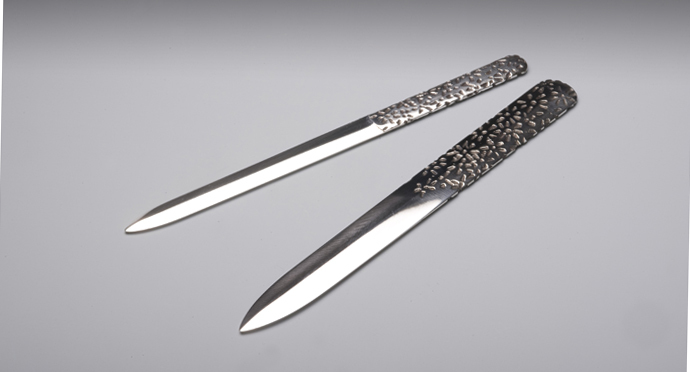 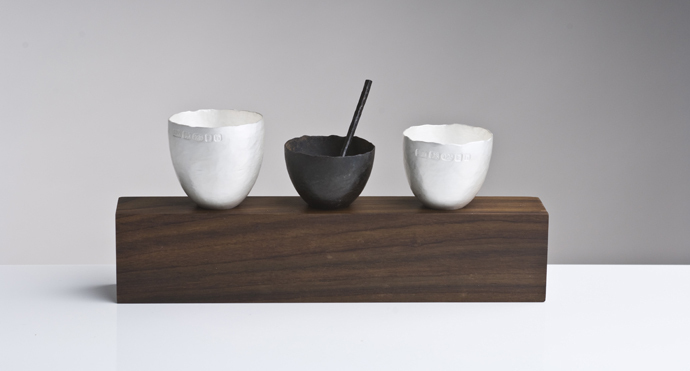 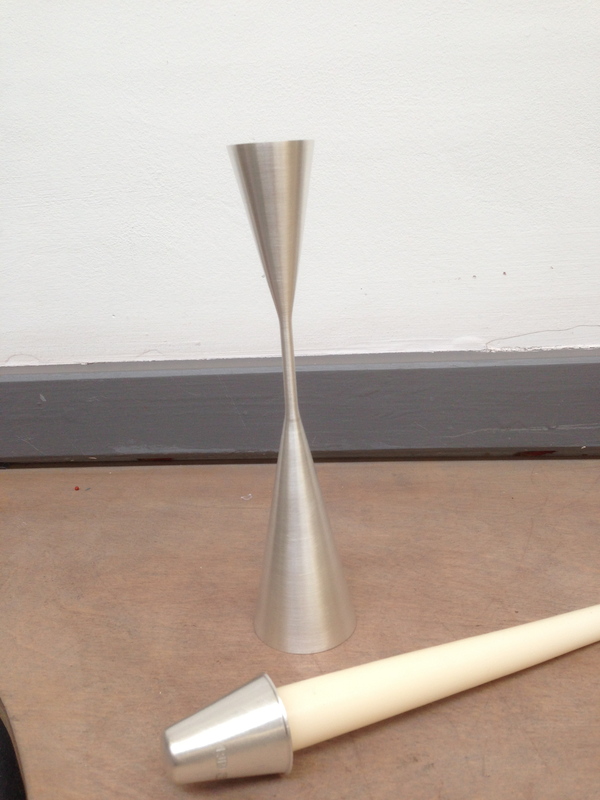 Angela’s beautiful silver condiment set made for her husband over many weeks. 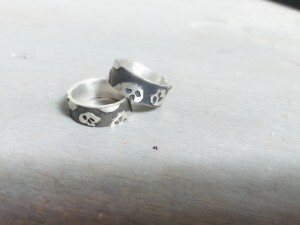 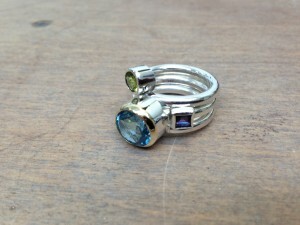 Janes stack rings silver and gold. 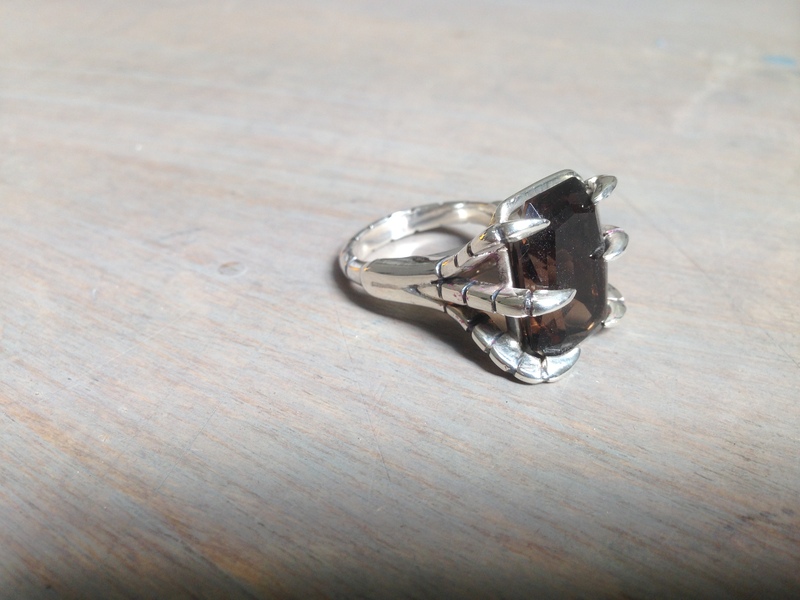 Vicky’s smokey quartz silver birds claw ring. 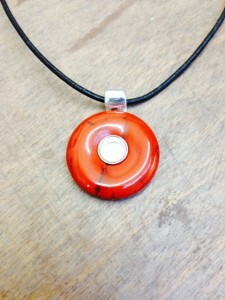 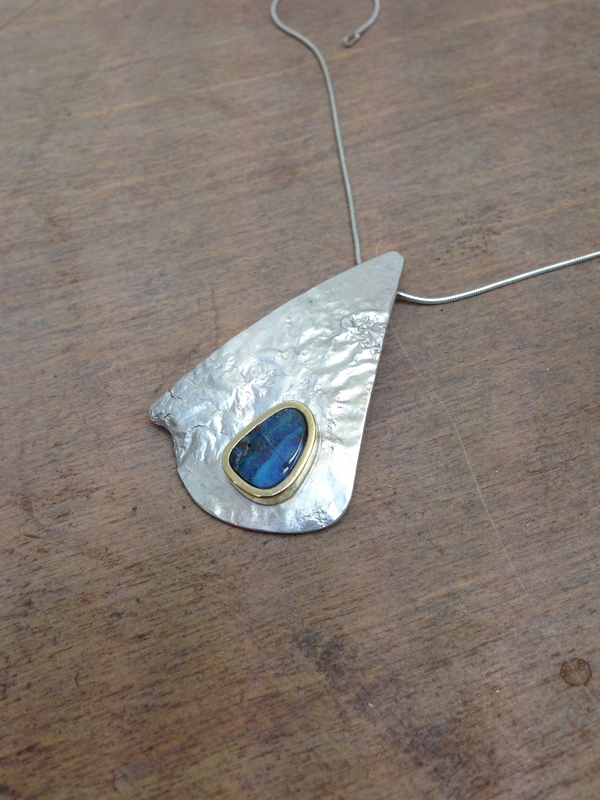 jane’s beautiful pendant with opal. 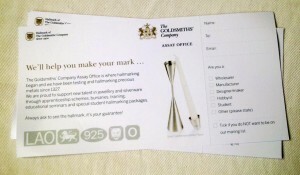 Penny’s finished candle stick and a picture of the Goldsmith’s business card; as they used Penny’s candle stick in their marketing as an example of excellent work. 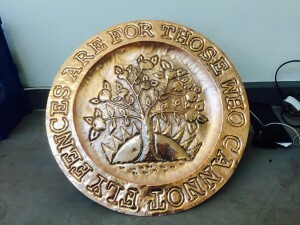 Well done Penny. 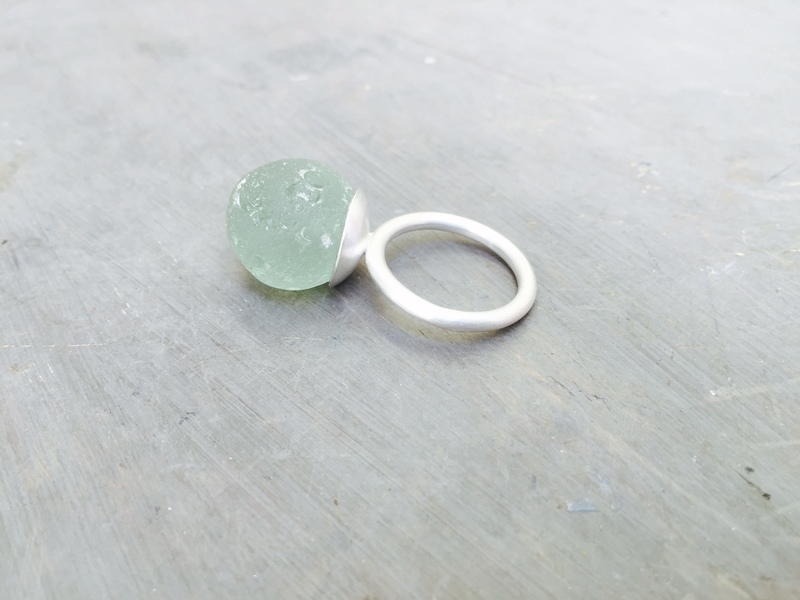 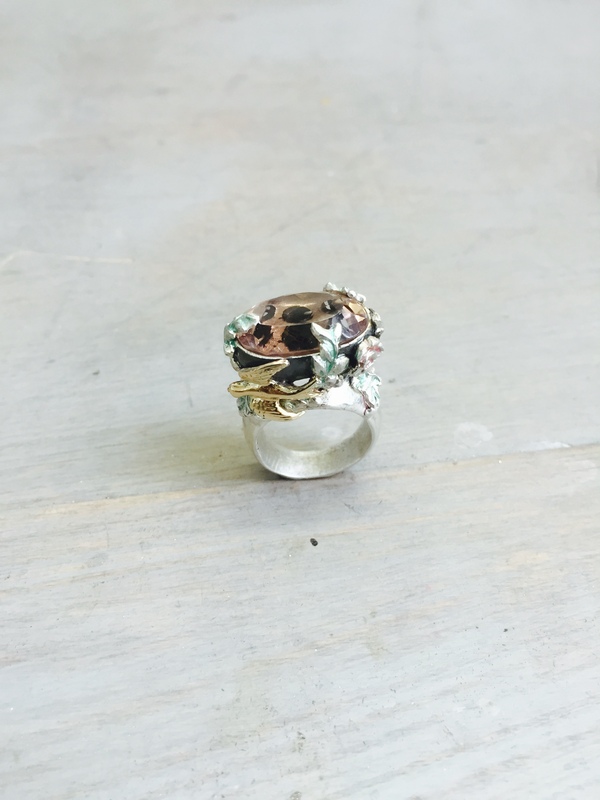 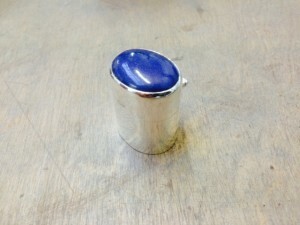 kerryn’s found glass silver ring. 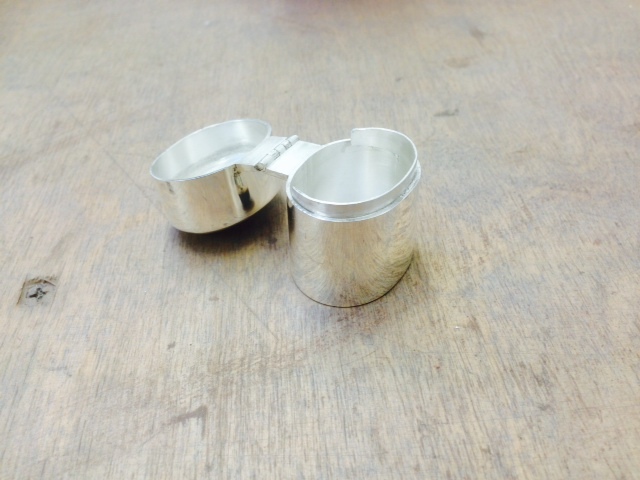 Made on the evening class. 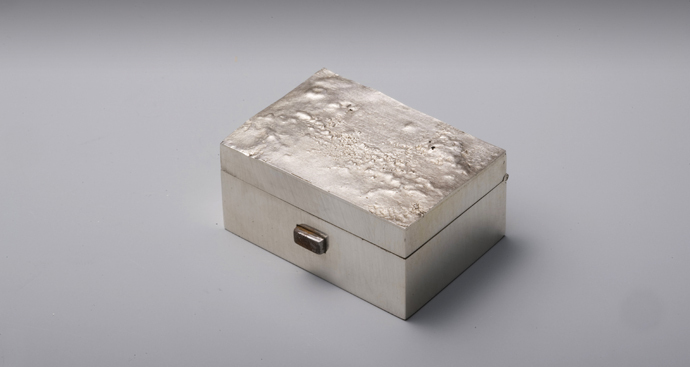 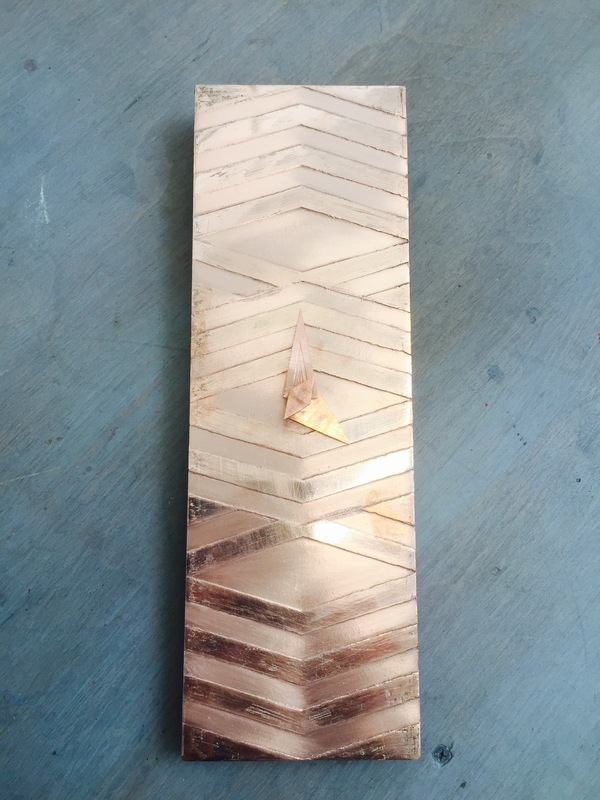 Jane’s silver hinged box and Lapis stone lid. 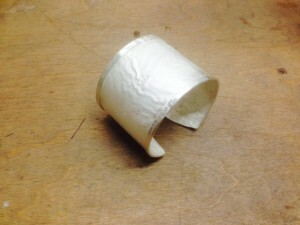 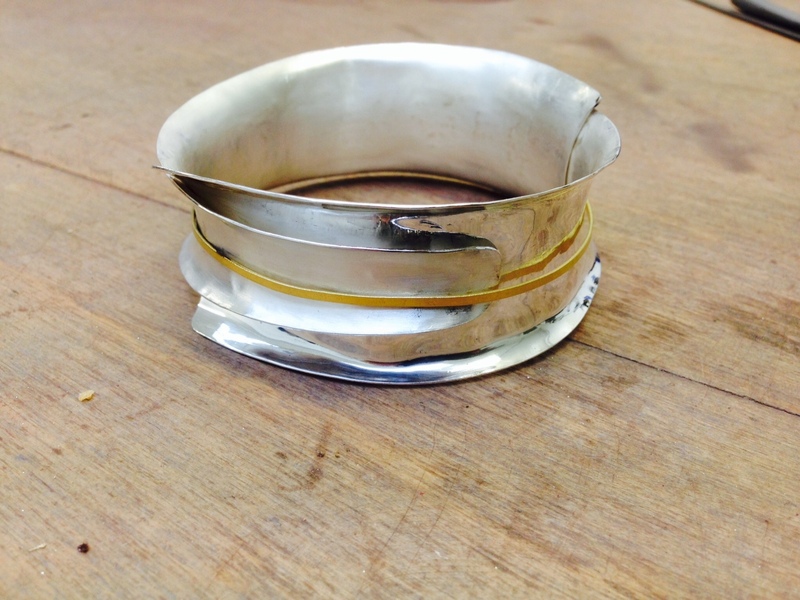 Merials reticulated bangle with folded edges. 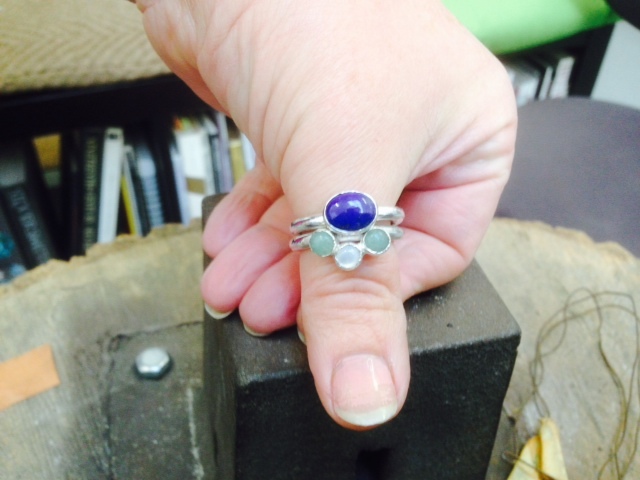 Kim’s first ever jewellery project, lapis and moonstone stack rings. 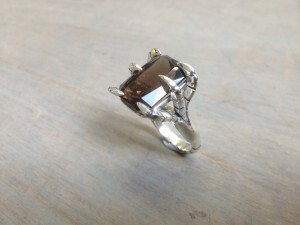 Kim’s latest ring two years on, rose gold and spinel. 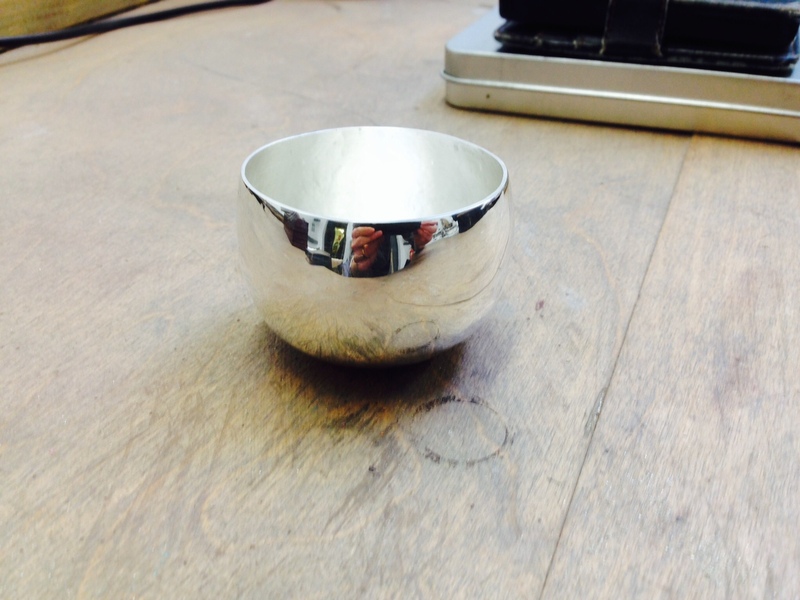 Angela’s silver tumbler, polished to perfection. Alison’s beautiful cast ring made on the casting weekend then finished off on her 12 week course. 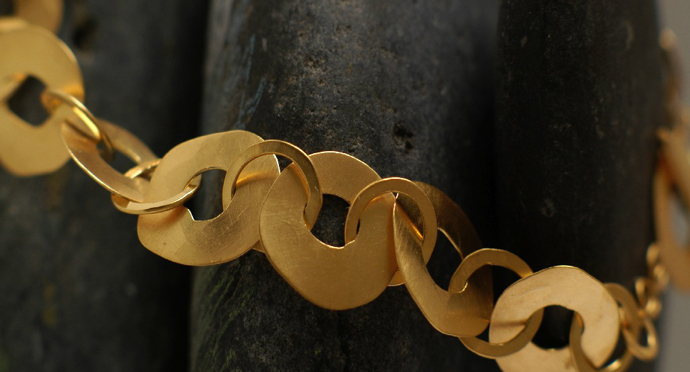 Ingrid’s anticlastic bangle with gold band.